Royal â€“ Jewelry Store WordPress theme is designed for the jewelers who are selling their jewelry products online. With Royal Jewelry Store WordPress Theme, you will be able to find multiple and creative options to showcase what you are offering. You can create an awesome jewelry online store with beautifully crafted elements available in the theme. You will have multiple categories to manage your products. You can also set an appointment through appointment page. 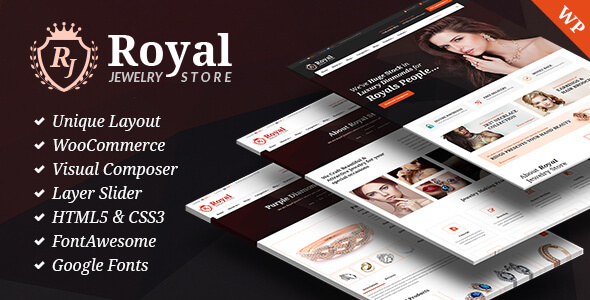 With Royal Jewelry Store WordPress Theme, you can have multiple pages for Gallery, Team, Shop and contact us. The theme is highly responsive whcih makes it compatible with all modern mobile devices. More importantly, it is niche specific design with a dynamic functionality that helps your business to capture the market online.